Sustainable Living Academy, Inc. (SLA) (formerly named Foundation for Sustainable Living) has been approved by the IRS as a nonprofit, tax-exempt, publicly supported organization under Section 501(c)(3) of the U.S. Internal Revenue Code, and is incorporated and registered in the state of Utah. As an approved 501(c)(3) nonprofit corporation, donations are tax deductible to the extent allowed by law*. 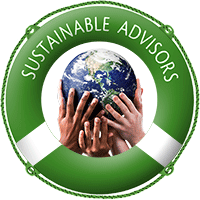 As a 501(c)(3) nonprofit corporation, donations to Sustainable Living Academy are tax-deductible as charitable contributions for US federal income tax purposes*. Additionally, Sustainable Living Academy can accept gifts and donations without the burden of federal income tax. Another advantage is that Sustainable Living Academy is able to apply and receive local, state, federal, and private funding through grants. The receiving of grants, gifts, and donations allows SLA to continue providing valuable information and services through it's Charitable Programs to those who are in need of sustainable assistance and solutions. If you would like to make a donation to SLA, please click the Donate Button to the left or visit Support Our Cause to find out other ways your gift of giving can help SLA to help others. We appreciate your generosity! 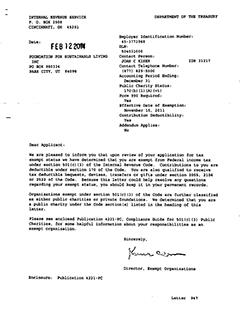 1) IRS Determination Letter: Click Here or on the image to the right to view or print our IRS Official 501(c)(3) Determination Letter. 2) IRS Website: Click Here to search the IRS database of exempt organization eligible to receive tax-deductible contributions. Once there, enter our Federal Tax ID #45-3773968 and click the Search Button. Please keep in mind there may be an excessive delay before the SLA non-profit status appears in the IRS database. Such delays are normal. 3) State of Filing: Contact the Utah State Tax Commission at 1-800-662-4335 or 801-297-2200 and provide our Federal Tax ID #45-3773968. Please note that state registration does not imply endorsement. * 501(c)(3) NOTICE: Please speak to a tax professional for any personal questions about tax deductible donations to Sustainable Living Academy, Inc. For more information about donating to public charities, please refer to Publication 526 “Charitable Contributions” as provided by the U.S. Internal Revenue Service.